Spain BonoLoto is a lottery that takes place six times a week - every Mondays, Tuesdays, Wednesdays, Thursdays, Fridays and Saturdays at 19:00 GMT. The very first BonoLoto draw was held on 28 February 1988. This lottery game aims to provide frequent draws at affordable prices and in 1991, Reintegro or Reimbursement was introduced to the game. “Reintegro” number is randomly assigned to the ticket upon purchase. Tickets with matching “Reintegro” number will win consolation prize of €0.50 per line played. Match six numbers to win the jackpot prize that starts at €400,000 and rolls over each time there are no winners. During the draw, a supplementary number called “complementario” (complementary number) is drawn, which is relevant to 2nd tier prize winners only. The largest jackpot of €7,000,000 was won in 1990 by a single lucky winner. Pick 6 numbers from 1-49 or use our “Lucky Pick” random generator to play for you. Minimum of 2 Lines per ticket is required to play this game. Add more lines up to 30 lines if you wish. You can play for additional tickets thereafter if you want. Choose your draw days. Play for either Monday, Tuesday, Wednesday, Thursday, Friday or Saturday draws or you can also play for all draw days. Select your weeks. You can play for the nearest draw or play for multiple future draws. Note: The system auto generates 1 number from 0-9 called “Reintegro” number for every ticket played. After placing an order with us, you will receive your OneLotto official ticket(s), which can then be viewed within your “My Account“ page. Our system will upload your Reintegro Number(s) onto your “My Account” page. Click “View Ticket” to see complete details of your Play Order. Once each draw has taken place and the prize breakdown has been announced, OneLotto will publish and upload the results onto our website. We will also send out a full result email to all participating players of the draw. 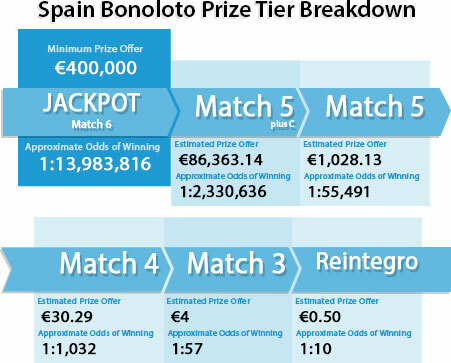 If your Spain BonoLoto ticket matches the Reintegro number, you will get a consolation prize of €1.00 per line played. In case of having no jackpot prize winner, the jackpot amount will rollover to the next draw.